If there is just one iconic Italian dessert known throughout the world it is undoubtedly tiramisù. This week’s episode of our Foodie Sisters video series sees Benny and Valeria take a closer look at this delectable pudding and share their thoughts and tips on the best ways to eat it in Rome. 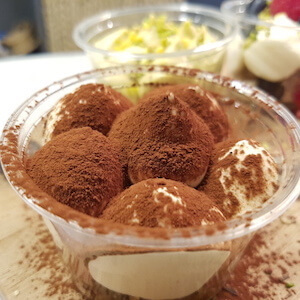 Tiramisù is found on restaurant menus from the top to the toe of Italy, and the traditional version is prepared with ladyfinger biscuits soaked in rich, dark espresso coffee then layered with a luscious mascarpone cream before being topped with cocoa powder. However, there are countless variations on the original which use all kinds of fresh fruit or liqueurs to create layers of flavor. Watch the video below to hear more about how to eat tiramisù in Italy and join Local Aromas for a cooking class to learn how to prepare it from scratch with a real Roman chef. Tiramisù is without a double Italy's favorite and most common dessert. Find out more about this delicious Italian recipe in our new video about food in Rome.